The Jesuit principles of leadership and the value of a “just” society provide the foundation for the development of the graduate program offerings at Le Moyne College. Why Choose Le Moyne for Your Graduate Studies? Le Moyne’s graduate programs in the Health Professions, Education, Arts Administration, and Business are all grounded in ethical principles and rooted in the nearly 500-year-old tradition of Jesuit education. With a goal to develop global relationships, all curricula incorporate a perspective on cultures and communities different from ours. Le Moyne’s 800 graduate students complement the 2,500 undergraduate students to create a vibrant learning community. The Le Moyne College Madden School of Business is AACSB accredited. The school’s Master of Business Administration program strives to develop managers capable of making sound decisions in an increasingly complex world, combining the art and science of leadership in a global perspective. The Master of Science program in Information Systems provides students with the valuable skills necessary to manage mega data using appropriate and powerful technologies. And the Master of Science program in Taxation produces graduates who are highly marketable in the high-demand speciality area. 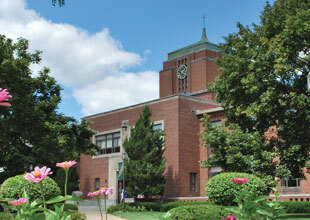 Le Moyne’s Jesuit tradition stresses ethical and value analysis as well as oral and written communication skills and commodities across numerous fields and disciplines. All Madden programs expose students to the skills and competencies needed for collaborative teamwork, effective supervision, strategic planning and decision making, entrepreneurship, human resource management/development, and innovating change. The breadth of health professions programs offered in the School of Graduate and Professional Studies supports the growing national and international need for competent and committed health care workers. The ever-growing demand for systems-based practice and team-based care in a world that has a growing need for access to patient-centered health care, developing health care infrastructures, and health concerns worldwide affords an opportunity for excellent placement of the graduates in the Physician Assistant Studies, Nursing, and Occupational Therapy programs. Theory-based course work is combined with practical experience in clinical and field work settings locally, nationally, and globally to ensure best hands-on practices. The graduate-level certification programs offered in the School of Graduate and Professional Studies are accredited by the Council for the Accreditation of Education Preparation (CAEP), which advances excellence in educator preparation through evidence-based accreditation that assures quality and supports continuous improvement to strengthen P-12 student learning. The graduate programs in Education enable students to gain New York State teacher and administrative leadership certification. Professors are experienced public and private school teachers and leaders and bring real-world case studies to the classroom to help students prepare for their pre-service teaching and leadership experiences. A Master of Science in Professional Education is also available for those interested in educating adults and children in non-certification positions in health care, nonprofit organizations, and community education programs, to name a few. Courses in Higher Education Leadership and Adult Education allow students to specialize their focus on these populations and environments. The College of Arts and Sciences houses the Master of Science program in Arts Administration and graduate certificate. This program provides the education and opportunities to study and apply management concepts in an arts environment. The curriculum combines specialized arts administration courses with management concept courses from the Madden School of Business. Students study marketing and fundraising, learn to collaborate with a board of directors, understand how to interpret financial documents, and gain perspective on managing a creative workforce. Theoretical knowledge will be applied through a capstone consulting project with partner cultural organizations, and a global perspective is woven throughout the course work. Programs in Business, Education, Arts Administration, and select Nursing offerings can be taken on a part- or full-time basis with course work taught in a traditional on-campus format or in a hybrid format, coupling campus face-to-face interaction with online assignments and work groups. The Physician Assistant Studies, Occupational Therapy, and Family Nurse Practitioner programs design their curriculum based on a full-time cohort format. Entering classes begin their respective programs at the same time and progress together through curricula that combine theory-based lectures and exercises with practical hands-on training in clinical and field work experiences. Le Moyne’s Department of Continuing Education provides access to undergraduate courses to meet prerequisites for admission to the graduate programs. Le Moyne is a proud Yellow Ribbon Program participant and has consistently been named a Military Friendly School.